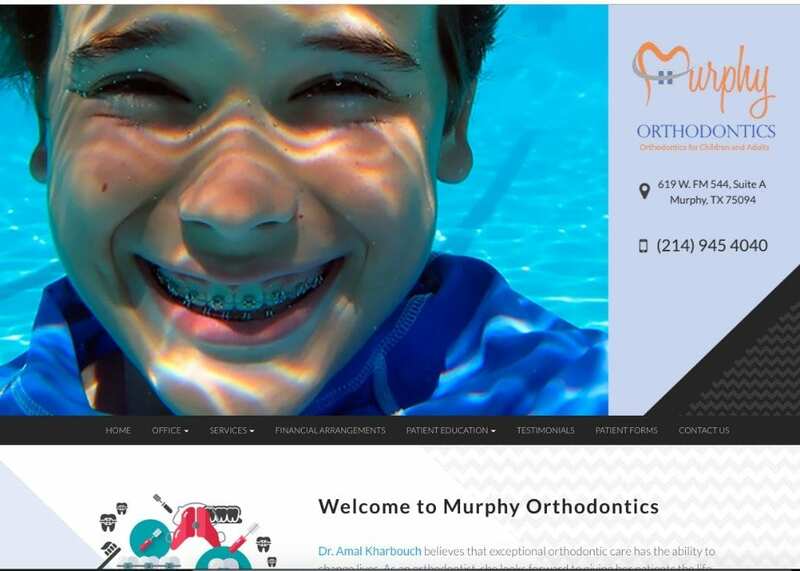 Dr. Amal Kharbouch manages Murphy Orthodontics in Murphy, Texas. With her use of cutting-edge dental technology and patient care, she aims to give her patients a life-changing orthodontic experience. To reflect her core belief, we created a website that would differentiate her from the other local orthodontic offices. Dr. Kharbouch’s website has a quirky, yet modern appeal. Above our drop-down navigation menu, we provided a header image that displays the laid-back, approachable feeling that Dr. Kharbouch aimed for. When dealing with any dental profession, you always want to ensure that the patients are comfortable and relaxed. To home page also features the office’s mission statement in video form. Not only is this a great way to have web-visitors interact with your site, but to also add another aspect of visuals that are usually not found in the dental industry. To learn more about the importance of visual communication, watch this short, 1 minute YouTube video. The navigation menu is set in black with a small white tone when highlighted. The background on the homepage is vibrant and has a variety of color. We did not stick to an actual color scheme when designing this project per the doctor’s request. We wanted to keep the background color to appeal to all audiences. Color is one of the main aspects of any website that a new web-viewer will notice. Choosing the correct colors or images to match your specialty or niche is key to optimal marketing success. To learn more about the psychology of color behind any website, watch this short YouTube video. The patient education tab features a video database that helps incoming patients review different dental services. This is a great way to help any patients with dental anxiety and can mean the difference between a skeptical patient to a committing, lifelong patient. Under the very same tab, there are also tips on maintaining your ideal oral hygiene and common problems you may face while taking care of your braces or teeth in general. All the images on the website reflect the unique and quirky appeal that is brought to life on the website. The information on every web page is complete and extensive while still being easily digestible. The wide background provides an optimal reading environment for incoming patients – space is expertly managed to cater to the frame and image sizing and formatting. We also used special effects to highlight the different services and promotions offered at the Texas office. The testimonials are featured on the navigation menu are a great way to engage and convince your site visitors to swing by the office. We used square frames throughout the website to space all aspects of the site appropriately. From a marketing standpoint, we made sure the design of the website would manifest with both younger and older audiences. With so many orthodontic offices in the State of Texas, you truly have to stand out and present yourself differently. We incorporated all the crucial design elements and enriched web pages with special effects to give a sense of modernism, but still, maintain professionalism at all times.